I watched the Listening Session yesterday. You know, the one where Trump needed notes to express empathy and pose questions. As I watched, I knew exactly what Trump would take from it – exactly what the NRA told him to. …immediately fire back if a savage sicko came to a school with bad intentions. Highly trained teachers would also serve as a deterrent to the cowards that do this. Far more assets at much less cost than guards. A “gun free” school is a magnet for bad people. ATTACKS WOULD END! 9/ publicly. Going to a range and shooting a stationary target at 20 yards in good lighting and showing basic safety proficiency is great. But I think many gun-owners don’t understand the level of training a person should have when charged with the duty of protecting others. 11/ -Have you trained at shooting moving targets? -Have you thought about the fact than an assailant might not be standing with their entire torso facing you straight on like they do on the paper target? -Have you trained in low light? -Have you trained in no light? 12/ -Can you load and unload your weapon in no light? -Have you trained at shooting from the hip? -Do you know how to disarm an assailant with a pistol and/or long gun at close range? -Do you know how to prevent being disarmed by someone at close range? 13/ -Do you know what a tactical reload is? -Can you shoot with one hand? -Can you reload your weapon with only the use of one hand? -Can you do all of the above with your weak hand? 14/ -If your strong arm suddenly became unusable could you both shoot and reload your weapon with the use of only your weak-side arm? -Do you understand that tunnel vision can (and likely will) keep you from noticing anything other than 1 threat at a time? 15/ -Would you know how to address 2 imminent threats? -What about 3 imminent threats? -Do you know the difference between cover and concealment? -Have you shot your weapon from behind cover, in prone position, or from a supine position? 16/ -Are you justified shooting someone with a knife? -What if they have a knife but are 20 feet away? What about 30 feet? What if it’s a pocketknife, a butter knife, or a baseball bat? What about scissors? -Should you shoot someone if they’re holding a gun to someone’s head? 17/ -What if they’re holding a knife to someone’s throat? -Can you take a human life? -Can you do any combination of the above with adrenaline surging through your body, your pulse and breathing at likely double their resting rate? 18/ -Do you know you’ll lose control of your fine motor skills under these physical stresses? Can you imagine the lawsuits? Can you imagine a gun fight at schools – because that’s what we’re talking about. How much friendly fire is okay? Will we arm teachers with AR-15 so they can match the shooter shot for shot? Will students running away from the school shooter be running into bullets fired by teachers/staff? 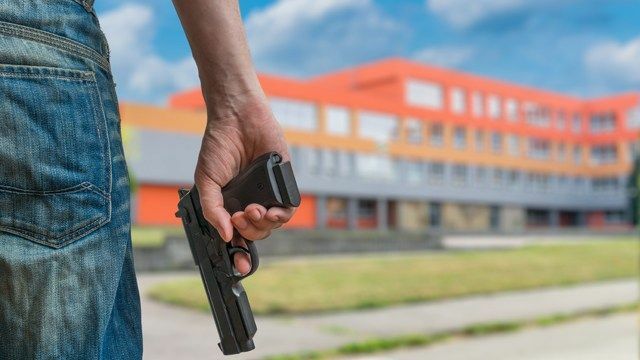 Will teachers carry the gun on their person at all times or will it be locked in a safe inside the classroom? So many questions – which aren’t even worth asking because this is the dumbest idea ever. What does the school community want and need? Yes, it is a ‘9/11′ moment, as brilliantly framed by one of the parents last night. The National PTA, the teachers’ union, school superintendents, principals. school nurses, school social workers, school counselors, school safety officers … What do they need? What does it look like? Cost was no object after 9/11. After the fiscally-irresponsible tax bill just passed, cost should be no object in the face of this continuing national crisis. And what can we do when the General Assembly returns to Dover in March? And if we need to raise the revenues, then do it. I have so many thoughts here. But Steve Halasz gets to the gist of it. There is a deep in the bone fallacy about gun ownership that is the work of the NRA to push. There’s a difference between owning a gun and being proficient with it. They want you to believe with a gun, a quick training course and and a commitment to defending your right to hurt people makes you into Raylan Givens (Justified FTW!). Regular PD hit ratios are fairly low (last one I saw for NYPD was 18%) and PD officers are required to train with their weapons throughout the year. Even the most elite shooters in a PD (SWAT team) are rarely 100%. For elite shooters, training is basically their job. So we have a bunch of people pushing the equivalent idea that just because you can buy dental instruments, you too can be a dentist. Many of the folks who think that teachers with guns is a good idea also think that teachers are not doing their first job well. And parents should be REALLY MAD at legislators who will fund hardening of their schools but won’t adequately fund the first job of that school — teaching the kids. Then what happens when a teacher shoots a kid when there is an active shooter situation? And lets also remember Philando Castile. Who ran the kitchen at his school and had a valid concealed carry permit. And there it is. Armed teachers, maybe something else like bump stocks, but I doubt anything more. From where I’m sitting this will be another way to blame teachers. Teachers who refused to be armed? The next school shooting is their fault for not stopping it. Armed teachers who don’t stop a shooter at all or fast enough or shoot an innocent child? Their fault. Any teacher who signs up to be armed in a school is someone who shouldn’t be in a school. Because they aren’t reality based. BTW, anyone who wants an AR-15 (or similar gun) should be denied access to all guns, because wanting that gun is the biggest red flag out there. Is that (example) $250 or $250,000? Just for context, Ben, I think the Lavelle-Katz state senate race was the only GA race ever in which a candidate spent as much as $250,000. The maximum allowed is $600.00. Those are full dollar figures, no extra zeroes. So a good guy with a gun — with way more training than any teacher will ever have — couldn’t proper;y execute on that training.